One thing we can’t seem to get enough of is good bread. Slathered with butter or jam and toasted, serving as the foundation for our favorite sandwiches, or served alongside dinner to soak up sauces and gravies, we are most definitely bread people. While I love a good, soft sandwich bread, there’s something about a crusty baguette that makes me a little extra happy. 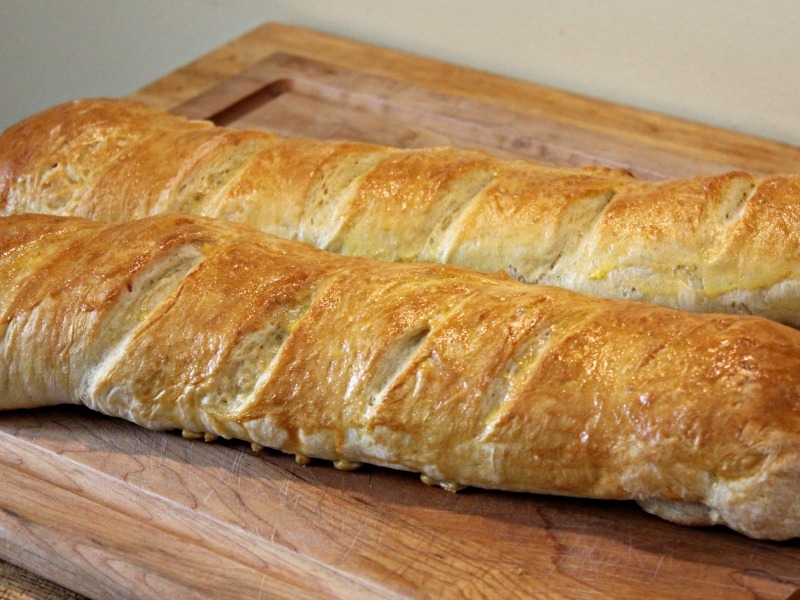 And the good news is, you can make 2 baguettes in less than a couple hours. I usually start the dough around lunch time so that the bread is finished baking just before I start dinner; this way, the bread is still warm when dinner goes on the table. If you need to bake your baguettes ahead of time, but still want warm bread with dinner or lunch, an easy way to achieve that is to wrap your baguettes in aluminum foil and place them in a low (200 degree) oven for ten minutes or so. Unwrap, slice them (or just tear off a chunk) and you’re good to go. 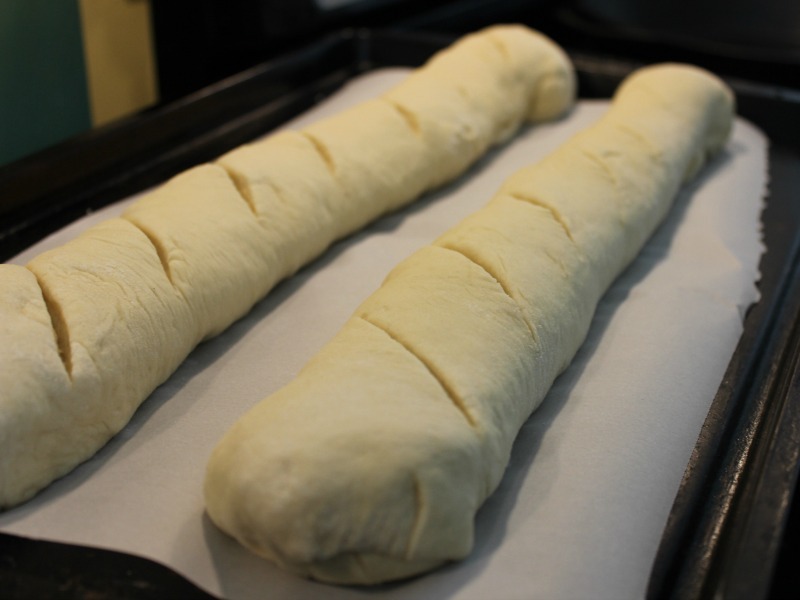 To make the baguette dough, simply add the flour, sugar, salt, and yeast to a bowl and whisk the ingredients together. Once that’s done, add the water. At this point, your bread needs to be… kneaded! If I’m in a hurry, I let my KitchenAid work for me, setting it on a speed of 4 and letting it work for about five minutes. If you don’t have a mixer or don’t want to use one, simply knead the dough for ten minutes on a lightly floured surface. Now, you just need to let it rise. Take your kneaded dough and add it to an oiled bowl (you don’t want the dough to stick to the bowl) turning it over so it’s fully coated in oil. Cover the bowl with plastic wrap or a clean kitchen towel and set it aside to rise in a warm, draft-free spot for 30 to 60 minutes. There are a couple of options here. I like to set my bowl near the woodstove in our living room. It usually rises in about a half hour there when the stove’s on. If your house is particularly cool or drafty, a good option is to turn your oven on before you start the dough, on the lowest possible setting. Let it warm up for about ten minutes, then turn it off. You can place your covered bowl of dough in the oven to rise. After 30 to 60 minutes, your ball of dough will have at least doubled in size. Now, it’s time to form your loaves. First: get out a sheet pan and cover it with parchment paper so your loaves don’t stick. If you don’t have parchment paper, you can sprinkle corn meal onto your sheet pan to do the same thing, plus add a bit of crunch to the bottom of the loaves. 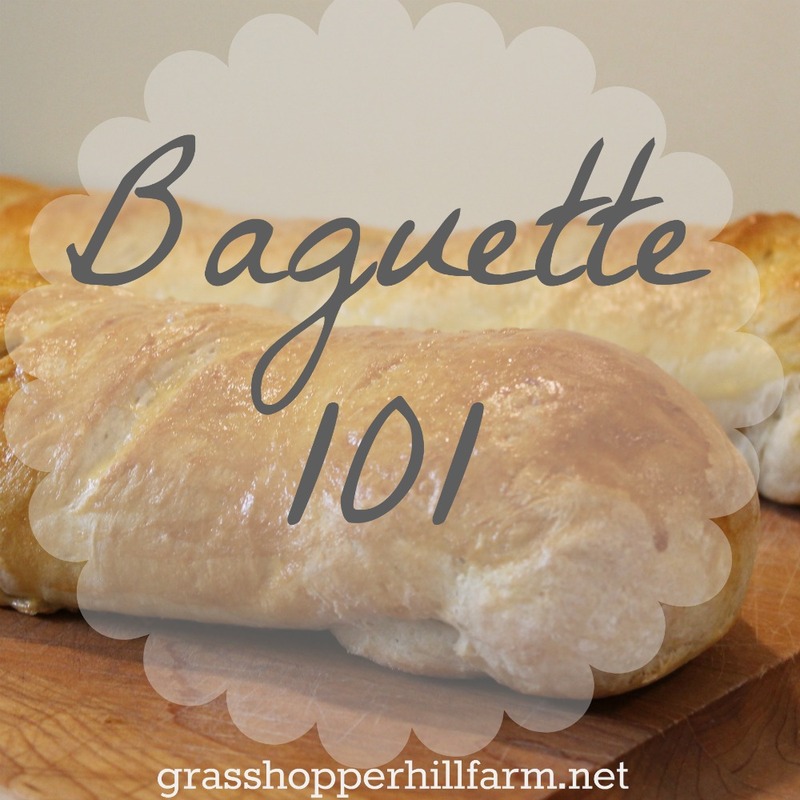 To shape your baguettes, divide your dough in half, putting one half back into the bowl and covering it so it doesn’t dry out. 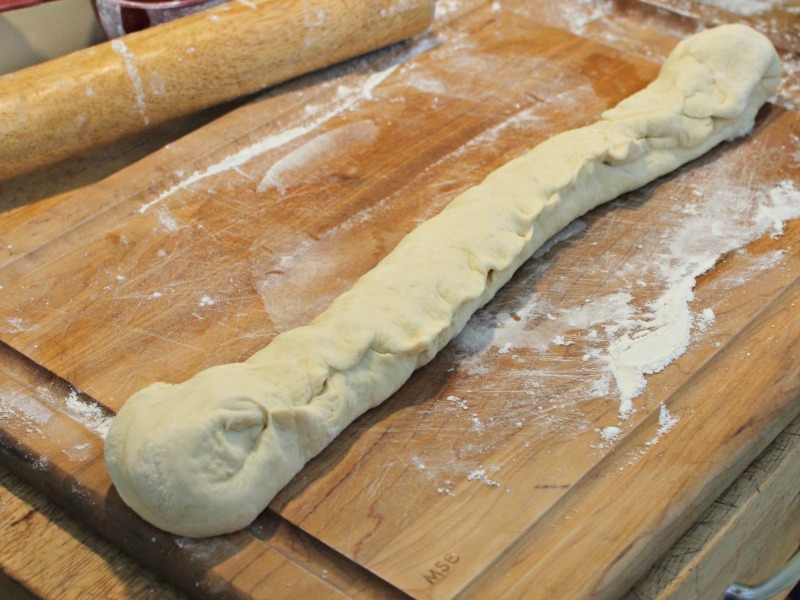 Flatten the other half of the dough, then roll it out into a roughly 14 x 8 inch rectangle. You do NOT have to be perfect here and there’s no need to get a ruler. Just roll it into a rectangle, and if it’s a little uneven, no big deal. You’ll just be rolling it up anyway. Once you have it rolled out. 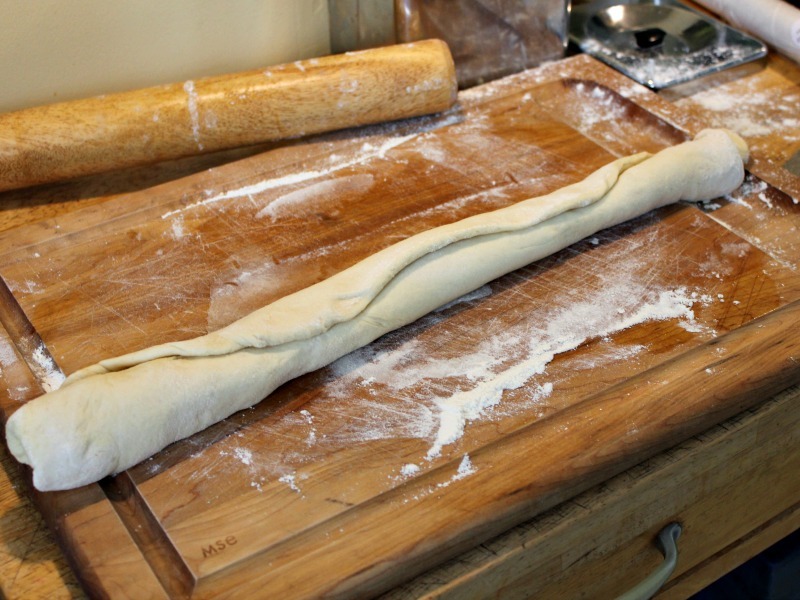 start at the long side of the dough and start rolling tightly all the way to the other side. Use a bit of water on your fingers and pinch that seam tightly. Now you have to deal with the ends. They’re probably a little uneven and weird-looking, right? Wet your fingertips again and fold them over to the seam-side of your loaf. There you go. Nice, neat ends, and all of your seams are on one side. Now, just place it on your sheet pan, flipping it over so the seam side is down. Slit the top of the loaves and cover them lightly with a towel or plastic wrap. Let them rise another thirty minutes. If you want that perfect, shiny baguette look, you’ll want to brush your loaves twice with an egg wash. To make the egg wash, whisk an egg with about a tablespoon of water. Right before the loaves go into your preheated 375 degree oven, brush them with about half of the egg wash.
Place your pan on a rack in the center of the oven and let the loaves bake for 15 minutes. After fifteen minutes, brush them with the rest of the egg wash, rotate the pan to ensure even browning, and then bake for 10 more minutes. There you go: two perfect, delicious, crusty baguettes, in less than two hours! To store this bread, you can wrap it in foil or, if you have bags from storebought sandwich bread (yes, I hoard plastic bags…), simply slip the loaves into those. The loaves freeze really well, too. Just wrap them up in foil or plastic, freeze them, and take them out the morning you want to eat them so they have time to defrost. 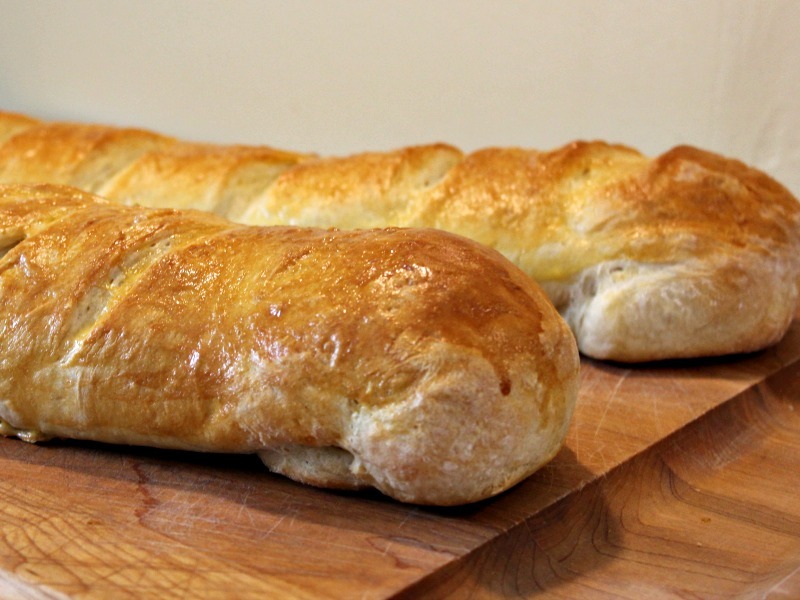 This is probably my favorite bread recipe, and it’s SO EASY. Good luck! Delicious, chewy, perfect baguettes, right from your very own kitchen. 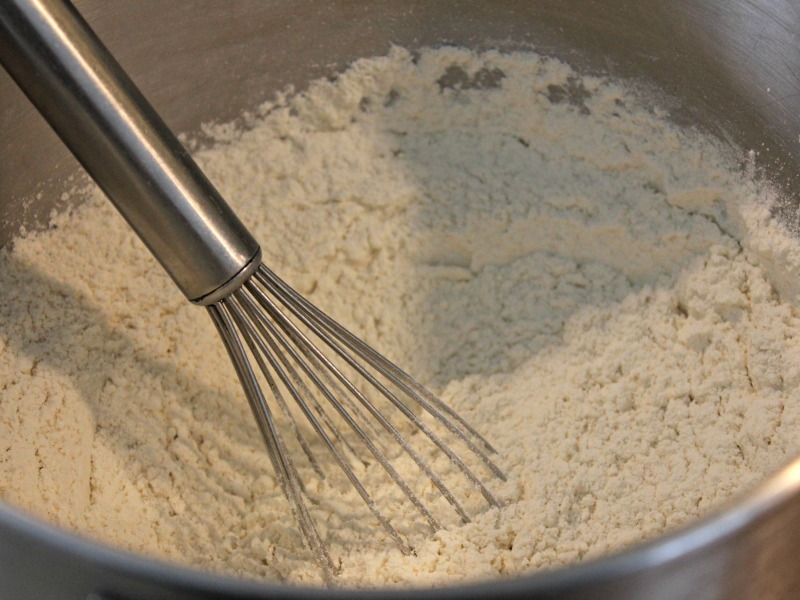 Add flour, sugar, salt, and yeast to a bowl. Stir. 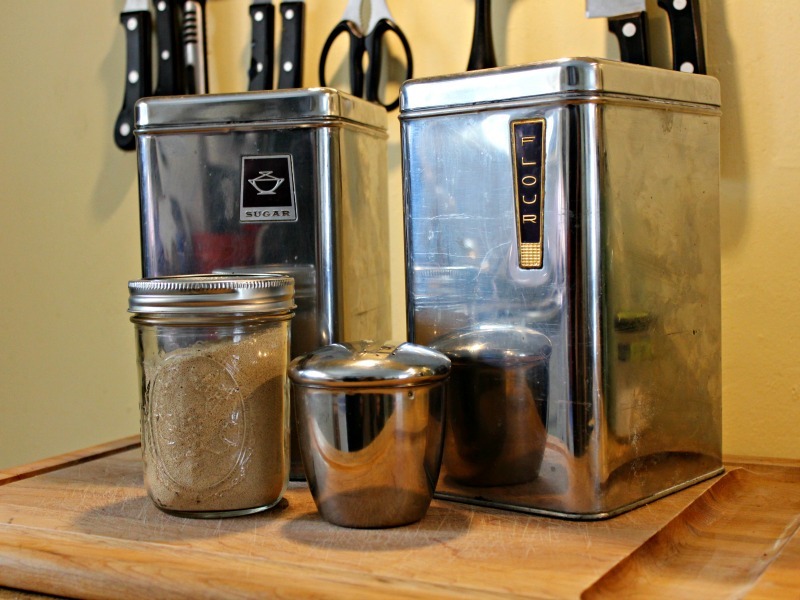 Knead for ten minutes by hand or for five minutes in a standing mixer. Let the dough rise in an oiled bowl for 30 to 60 minutes in a warm, draft-free spot. Divide dough in half. Working with one half at a time on a floured surface, flatten then roll with a rolling pin into a 14 x 8 inch rectangle. Starting at the long side of the dough, roll into a cylinder. Pinch seam closed. Fold over ends to seam side, pinch closed. Place loaves, seam side down, on a parchment covered baking sheet or a baking sheet sprinkled with corn meal to prevent sticking. Cut slits in the tops of the loaves with a serrated knife; allow to rise for 30 minutes. Brush with 1/2 of the egg wash (optional) then bake for 15 minutes. Rotate pan, brush with remaining egg wash, and bake for 10 more minutes.